The National Coastwatch Institution (NCI) is a voluntary organisation set up in 1994 to restore a visual watch along UK shores after many small Coastguard stations closed due to Government cutbacks. NCI wears a uniform. "In essence this consists of a dark blue sweater and white shirt, with or without a black tie, dark blue or black trousers and black shoes. You will be offered epaulettes and thus the ideal sweater is one with shoulder straps such as a naval sweater (generally known as a ‘woolly pulley’). Headgear is optional but, if worn, should be a dark blue cap or a beret. Motifs, other than an NCI badge, should not appear on the cap. The wearing of a recognisable uniform is of great assistance and encouragement when dealing with the public and raises the whole level of the NCI awareness. NCI has access to suitable clothing at cost. " Interesting. Reminds me a little of the USCG Auxiliary. 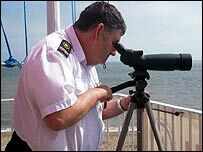 Do these guys do search and rescue and other similar missions or is it strictly coast watch, i.e. early warning? This is a volunteer organization, totally privately funded, created after the closure of HM Coastguard stations.